Jonathon Jennings and Trevor Harris engaged in a classic quarterback duel on Saturday night. Both quarterbacks put up eye-popping passing numbers, but it was Jennings and the BC Lions who came out on top over Harris and the Ottawa REDBLACKS. After a thrilling, back-and-forth contest, a late pick-six by Anthony Gaitor secured a 40-33 win for the Lions. Jennings and the Lions offence were put in a position to respond right from the start of the game. On the REDBLACKS’ opening drive, Harris led a clinical touchdown drive to give his team an early six-point lead. It took Jennings two plays to respond with a touchdown of his own on a 30-yard pass to Chris Rainey. This set the tone for the back-and-forth contest that ensued between these two teams. Neither team found a strong rhythm on offence until late in the second quarter. 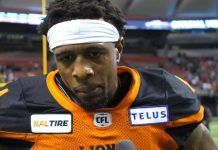 After the teams traded a series of field goals, Jennings led a drive that ended with Travis Lulay punching it in from one yard to give the Lions a 20-13 lead. Less than a minute later, Harris came right back with a 68-yard touchdown pass to Chris Williams, which tied the game. The madness continued, as it took Jennings just four passes and 40 seconds to take back the seven-point lead on a touchdown drive capped off by a four-yard Manny Arceneaux touchdown. The half finally concluded with a 34-yard Chris Milo field goal, which made it 27-23 heading into the second half. Both defences managed to tighten up to start the second half, as neither offence managed to gain traction until late in the third quarter. Mossis Madu capped off a REDBLACKS drive with a six-yard touchdown run to give his team a 30-27 lead heading into the fourth quarter. Jennings responded once again. Four plays later the Lions gunslinger connected with recently acquired wide receiver Terrell Sinkfield on a thirty-one yard touchdown pass. Jennings noted that Sinkfield could be a dangerous element for the Lions at this point in the season. “When the ball is in his hands, he can make something happen,” said Jennings. 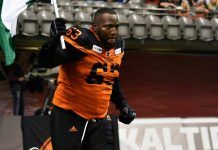 “(Sinkfield) is a huge weapon for us, and he’s going to be critical for us down the stretch.” Sinkfield was added to the roster two weeks ago, after being cut by the NFL’s Minnesota Vikings. After the Lions added a single point on a punt in the end zone, the REDBLACKS cut the lead to one on another Milo field goal, which made it 34-33 with six minutes left. After burning some clock, the Lions forced the REDBLACKS deep into their own zone with just 19 seconds left to mount a comeback drive. The Lions put pressure on Harris, which forced a bad throw, and Gaitor picked it off with ease and took it to the house to end the game. Jennings finished the game completing 20-of-25 passes for three touchdowns and no interceptions, while Harris went 32-of-45 for two touchdowns and just the one interception. The Lions also had success on the ground, with Anthony Allen returning as starting tailback. Allen rushed for 82 yards on 12 carries for an average of 6.8 yards per carry. With the win, the Lions moved to 9-4 on the season, two points ahead of the Winnipeg Blue Bombers for second place in the West Division and four points ahead of the Edmonton Eskimos. The next two games will be huge for the Lions as they battle the Blue Bombers in back-to-back weeks. These high-pressure starts will give Jennings a chance to show just how far he has come in his development as a high-end starter in this league.